Individuals in St. Charles County make their homes in the most unlikely places – under bridges, in parks and in the woods. Most families call an apartment, a house or a condo a home. Several individuals have made a home in the most unlikely places—under bridges, in parks and in the woods. A group of men and women have set up camp underneath a highway bridge, utilizing the beams to hang their jackets, clothing and sleeping bags. Old, worn out sheets have been hung to separate living spaces. A blanket covers the hard concrete floor to protect bread and food from the outdoor elements. Discarded sofa cushions and a broken down futon act as a bed from the unforgiving ground. 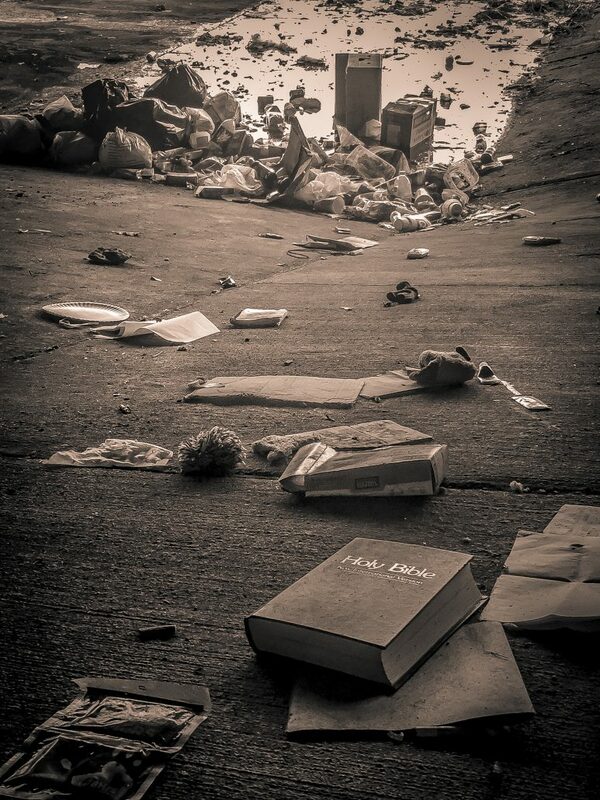 Amid the makeshift home, a bible rests on the ground, a sign that faith has not been forgotten. Others find refuge in makeshift homes at local parks or dilapidated buildings in the woods. At first glance, they appear to be campsites or homes left abandoned. These homeless community members are looking for work, and flying signs begging drivers for assistance in the interim. These men and women struggle for the most basic needs—food and shelter. Many visit the Salvation Army for hot meals, and Showers of Blessing for a weekly shower. Most of these ‘homes’ are in plain sight of hundreds of daily passersby. Yet, so many still believe there are no homeless in St. Charles County. © Content copyright 2017 Sts. Joachim & Ann Care Service. Website by Hen's Teeth Network.